So I needed a longer USB cable. Newegg.com to the rescue. Found a nice generic brand cable with good reviews (they tend to be every bit as good as the 24K gold, diamond encrusted name brand cables you can buy at certain electronics stores). 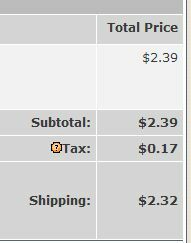 The irony of it all is that the shipping is just a few cents shy of being more than the cable. Still cheaper than going to the store, but silly it costs so much. Is this a complaint? No not really, shipping isn’t free, I know that. And it’s not the sony screw incident, but it’s still odd.